Oracle VM Manager provides the ability to create tags which can be used to identify and group together objects. This functionality makes it easier to quickly limit views of objects and to perform batch operations against objects sharing a common tag. 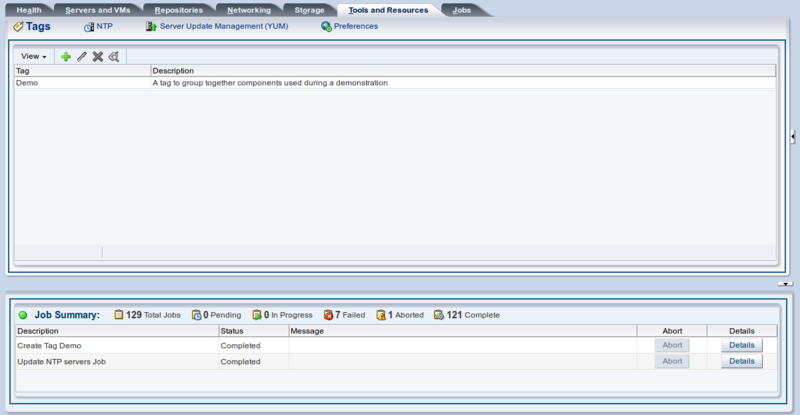 Tags are managed within the Tags subtab on the Tools and Resources tab within the Oracle VM Manager user interface. 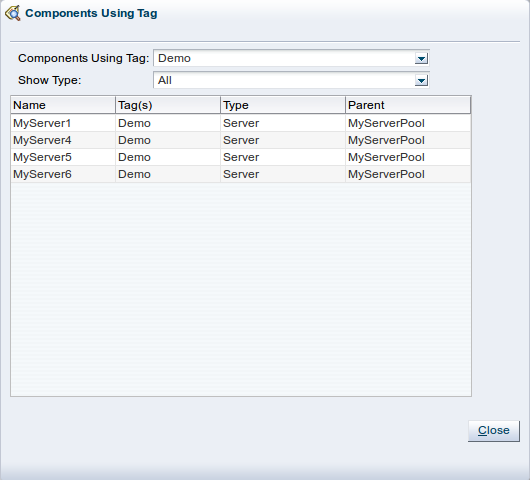 The Tags tab provides facilities to add , edit and delete tags. There is also an option to Find Components that share a common tag. These options can be accessed either using the toolbar at the top of the tab, or by using the context menu that appears when you right-click on an item within the panel. Clicking on the Create New Tag icon, or clicking on the Edit Tag icon, will bring up a dialog box that allows you to enter the Tag name and a description for the Tag. Tag names are case-sensitive. Tag names are unique and cannot be duplicated. 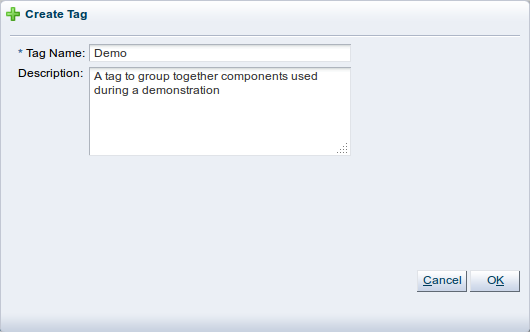 Once tags have been created within Oracle VM Manager it is possible to assign them to various components or objects. This can be done by either editing existing objects and adding tags within the dialog that appears, or during the creation of a new object. For instance, to add a tag to an existing server you should locate the server on the Servers and VMs tab and select the option to edit the server. In the dialog that appears, click on the Tags tab and assign the tags that you wish to use to identify the server in future. Tags can be reused across objects of different types. For instance, the same tag used to identify a particular set of servers can also be used to group a set of virtual machines together. To see all objects that share the same tag, you can click on the Find Components icon on the Tags subtab on the Tools and Resources tab. The Find Components feature supports multi-select functionality, allowing you to search for components that are tagged by a number of separate tag names. Furthermore, the Find Components dialog allows you to filter results by object type, by selecting a particular object type from the Show Types drop-down selector. 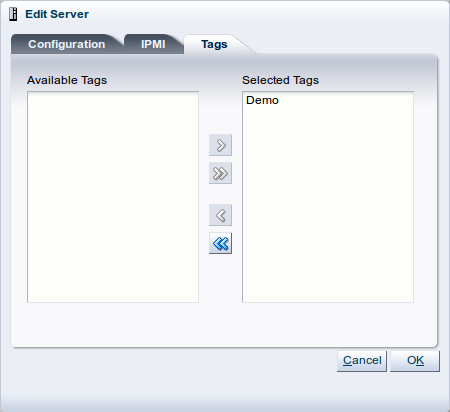 Many screens within the Oracle VM Manager user interface provide the option to use a Tag Filter. This feature takes the form of a drop-down box listing the available tags that can be used to form a filter. Selecting a tag limits the view in the current screen to objects sharing the same tag. On a screen that also provides the Name Filter option, it is possible to switch between the filter types by selecting the appropriate filter type from the drop-down menu. Once a view has been limited using the Tag Filter function, batch operations can be performed on all items listed by using shortcut keys such as Ctrl-a to select all items before selecting the operation that you wish to execute.